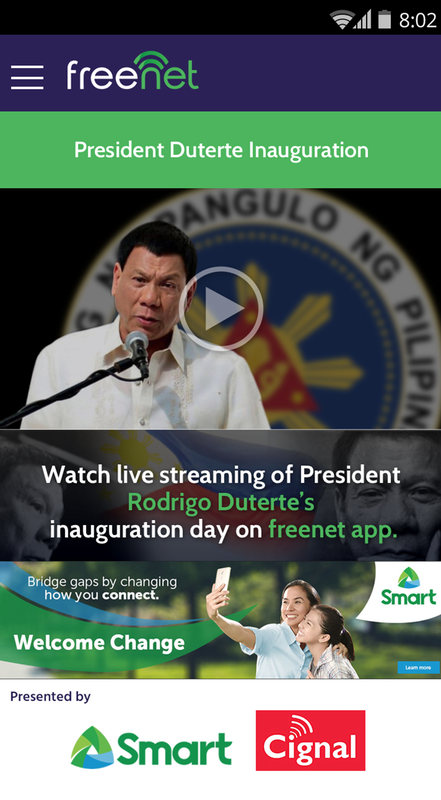 Smart To Air The Inauguration Of President Duterte Via Freenet App For FREE! Home / news / services / smart / Smart To Air The Inauguration Of President Duterte Via Freenet App For FREE! Great news! We just got a word from Smart Communications Inc., that they'll provide a FREE mobile live streaming during the inauguration of Rodrigo Duterte as the 16th President of the Republic of the Philippines this June 30, 2016. All users of Smart, TNT, and sun nationwide will be able to access that live stream with the use of freenet, the free data platform curated by Voyager Innovations in cooperation with Cignal TV. 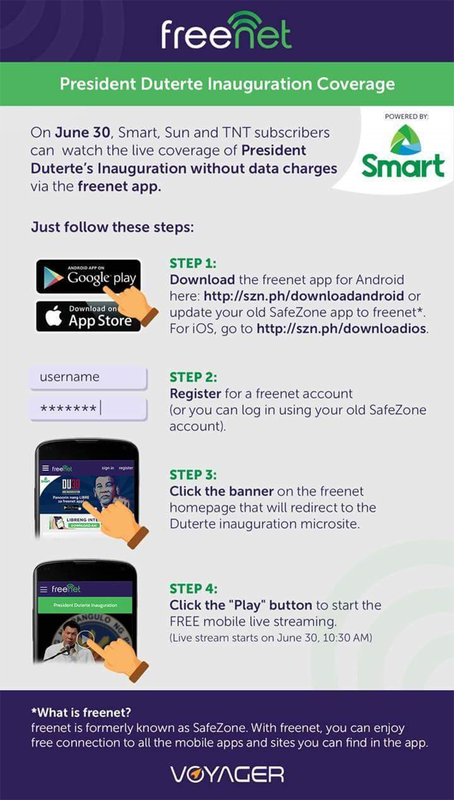 The subscribers just need to download the "freenet" mobile app from Google Play Store or SafeZone app from Apple App Store to view the live-stream of President Duterte's historic inauguration wherever you are in the country. In that occasion, Voyager will also officially launch the new freenet brand by Voyager Innovation that's previously called SafeZone. With the use of freenet app, users can continue to access selected apps and websites totally for FREE. There are over 70 brands and enterprises that uses the freenet platform that allows their users to access the internet freely without worrying about unintended data charges..
Presumptive President Duterte won via landline without the traditional money and machinery with the use of Social Media revolution. In that sense, he was dubbed as the first-ever "Social Media President" as he was able to fully utilize the power of social media during the elections. He'll be assuming the highest post in the country inside the Rizal Hall of Malacañang Palace, instead of the usual bigger Quirino Grandstand. Despite having that smaller and more intimate place, more people will be able to witness this event with the use of Social Media thru Smart's freenet platform. With that style, more people (half of the country), even those who don't have television on the go can watch and take part of this historic event for free. Aside from the inaugration, June 30 is also dubbed as the "Social Media Day" all around the world. Here in our country, there will be an occasion led by TweetUp Manila at the Samsung Hall of SM Aura Premier in Taguig City that's supported by Smart, Voyager Innovations, and PayMaya Philippines. They have a theme of “#TayoPH,” that reminds everyone that social media can be used as a tool, voice, inspire, and empower the citizens just like what it did last elections. It can give us a lot of information and provide us with the voice needed to make each other better. "Through game-changing digital platforms such as freenet, Fernandez said Voyager Innovations aids in the digital and financial inclusions of Filipinos with the help of technology. Among the areas of digital life that its platforms and services are enabling include financial technology, digital commerce, rich mobile marketing, digital payments and next-generation communications." Let's all welcome change with joy and be positive that this is the start of a better Philippines. Exciting times right?